Position a loaded barbell on the floor, at the head end of a decline bench. 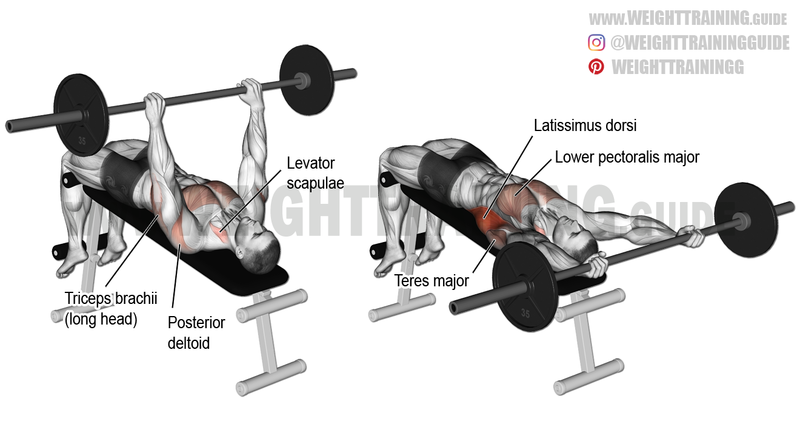 Lie supine (on your back) on the decline bench and hook your feet under the foot pads. Pick the barbell up from by your head using a narrow pronated (overhand) grip and press it up over your chest. Keeping your elbows very slightly flexed, inhale as you slowly lower the barbell backward and downward in a semicircular motion until you feel a mild stretch under your arms. Exhale as you slowly reverse the motion and return the barbell to the starting position, over your chest. Keep your elbows fixed in a slightly flexed position to protect your elbow joints. If the barbell is too hard on your wrists, try an EZ-curl bar. You can also use a dumbbell. Pullover exercises, such as the decline barbell pullover, may not be suitable for people who have shoulder problems. See also the decline bent-arm barbell pullover. Just want tо say your site is very helpful. Have you ever thought about making an app? Yes, I am in the process of having an app developed. It will combine my ebook with the exercise database on this website, as well as feature some other goodies. Hope to launch it in early or mid-2018.